James was born in Portsmouth on 10 May 1875, the son of John Henry Grigg and his wife Sarah née Foreman. Both his father and step-grandfather were old service men, his father in the 7th Regiment of Foot and his mother's step-father in the Royal Marines. His father, John, who also served in the 7th Regiment of Foot (later renamed the Royal Fusiliers), died while James was a child. His mother remarried, in 1879 to David Herbert from Newbury. David had served with John Grigg in the 7th and may well have been a family friend before John's premature death. The family settled in Newbury (Mayor's Lane) and James and his elder brother John got four half-siblings (David Percival, Elizabeth Harriet, Charles W and George Henry). Following his schooling at the local Church of England school James got a job as an errand boy. On 30 1891 January James enlisted in the local volunteer company (3rd Royal Berkshire Regiment). He lied about his age, claiming to be 17 years and 1 month old. Two and a half years later on 15 July 1893 he became a full-time soldier when he transferred (claiming to be 19 years 1 month old) into the regular Royal Berkshire Regiment. His physical descirption shows that in 1893 he was 5ft 6¼in (3½ ins taller than in 1891), 10st 1lb, and had a fair complexion, blue eyes and brown hair. James was following his brother John who went from volunteer to regular a year or so ahead of James. Meanwhile, in 1892, their step-father, David Herbert dies, leaving Sarah to care for the six children from her two marriages. John and James must have taken on significant responsibility to contribute to the family budget through ther work as labourers. By the time he enlisted in the Regular Army in 1893 James was employed as a groom, hopefully better paid than his earlier labouring work. As a regular (Pte 3877) with the Royal Berkshire Regiment he was on home service until 13 February 1898 when he and brother John went to South Africa with the 2nd Battalion, Royal Berkshire Regiment from 1898 to 1902, earning both the Queen's South Africa Medal (with three clasps) and the King's South Africa Medal (with two clasps). All of James' were represent states where he served as opposed to battle clasps. It has to be said that he was not a model soldier - every time he earned good conduct pay (an extra 1d a week) it was not long before he lost it through indiscipline (on at least one occasion fueled by drink). He spent a total of 184 days in prison or undergoing Field Punishment No 1 - 94 of these resulting from his striking his superior officer (10 in custody pre-trial and 84 in prison with 'hard labour'). These days did not count towards his term of service, meaning that he was discharged six months later than he would otherwise have been. In 1899, while James and John were in South Africa, his mother married for a third time, to Edward Woods. He was demobilised in 1902 on his return to England, and returned to Newbury, where he married Sarah Annie Corderoy at Newbury Register Office on 5 July 1905. Their first child, Harriett Elizabeth was born 1 October 1905, followed by Cissie Annie (20 November 1907) and James George (27 February 1913). Shortly after the outbreak of war, on 25 August 1914, James volunteered for the Royal Berkshire Regiment and was posted to the 5th (Service) Battalion, one of the new battalions created from the thousands of young men coming forward, eager to serve their country. It soon became apparent that he was no longer fit enough for active service and he was discharged on 11 November 1914 as 'not being likely to become an efficient soldier'. However, he had been a member of the National Reserve, 4th (Territorial) Battalion Royal Berkshire Regiment, before the war and returned to them following his discharge from the 5th Battalion. The local National Reserve (the 'old and bold' as they called themselves) were assigned to guard internees held at Newbury Racecourse. Conditions at the Racecourse were not very good and the fate of the internees became a cause célèbre for a few as German propaganda exagerated the 'maltreatment' of German civilians in the camp. Before long most of the internees were sent on to the Isle of Man, which became the country's main internment camp. By the time James joined up with the National Reserve it had been decided to close the Newbury camp and reallocate the guards to duties guarding prisoners of war housed in ships anchored off the south coast; James went with them. He was then posted to similar duties at Winchester, then Weston-super-Mare, and finally to Barton-on-Sea. While at Barton-on-Sea he was taken ill and sent home for a short period of sick leave. However, on his return to the Regiment his condition worsened and he died on 22 January 1916, reportedly of pneumonia, but, according to his death certificate of 1. Haemorrhage 2. Perforating ulcer of duodenum - perhaps these were caused by pneumonia? Death of an old service man. The death was recorded on Saturday last of Private James Griggs, of Market-street, Newbury, who was attached to the Headquarters No 1 Supernumerary Company of the 4th Royal Berks, stationed at Barton-on-Sea. The deceased had been in uncertain health for some years, and was well-known in the town. 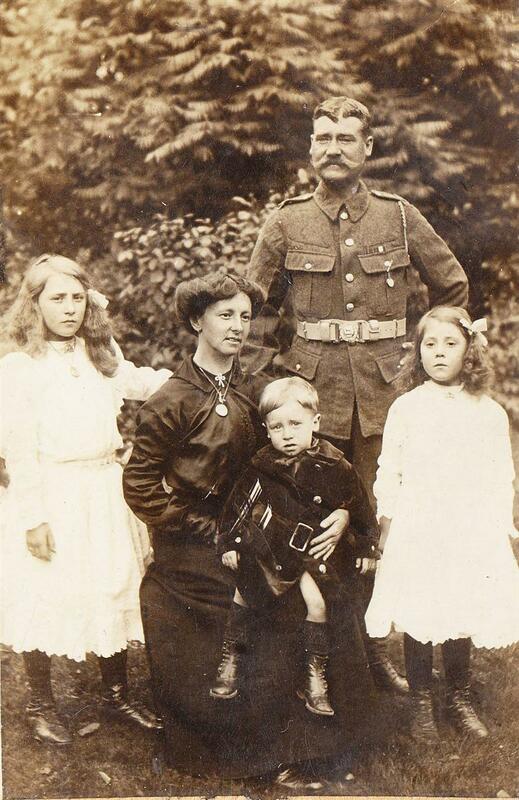 He had been home on sick leave for a few days, and on his return to his regiment succumbed to pneumonia, leaving a wife and three children to mourn their loss. Pte Griggs was an old Royal Berks ex-Regular, having joined that regiment in 1893. 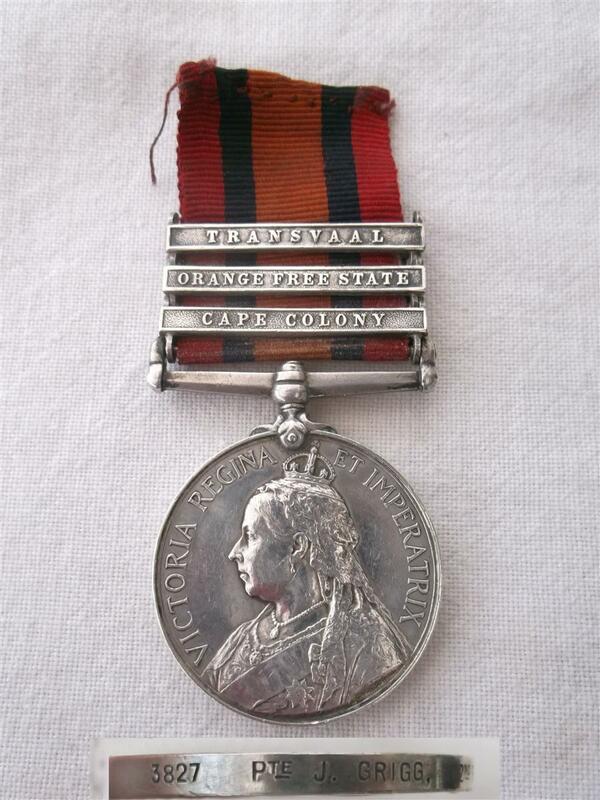 He served in the South African Campaign, for which he held both the King’s and Queen’s Medals. Since the outbreak of the present war he had been doing duty in the National Reserve (4th Royal Berks). He belonged to the Prison Guard at Newbury Racecourse until December, 1914, after which he went on board ship; from there he was successively drafted to Winchester, Weston-super-Mare, and Barton-on-Sea. Deceased made an efficient soldier, was popular with his comrades, and well thought of by his officers, Captain A C Bermester, of Hungerford, the CO, sending a letter of sympathy to the family of deceased. The interment took place yesterday (Wednesday) afternoon at the Municipal Cemetery, the Rev L R Majendie officiating, and as evidencing the respect in which deceased was held, representatives were sent from headquarters at Barton-on-Sea and Weston-super-Mare, to attend the funeral. The band of the Berks Regt from the depot at Reading was also present, the bearers being supplied from the same source. The firing party was supplied by the 339th Company ASC, stationed at Newbury Racecourse, by permission of the CO, Major Clark. But as it was found impossible to requisition a gun carriage, the body was conveyed by hearse. A large number of people were present in the streets and at the graveside, and an impressive scene was the firing of the funeral volley over the grave, and the sounding of the “Last Post” by the 339th Company trumpeter as the closing detail of the funeral obsequies. The officer in command was 2nd Lieut Bidmead, of the 9th Royal Berks, attached to the Recruiting Staff, while Sergt Streams, the senior sergeant of deceased’s company, with two men, brought the body from Barton-on-Sea and represented the company at the funeral. All the local military arrangements were made by Co-Sergt-Major Mew, who was home on leave from the 4th Royal Berks. The mourners numbered 14, and included the widow and three children, mother, brother, and sisters. There were a number of floral tributes, including those from the widow and children, sister Harriett, Charlie and Lizzie, the Officers, NCOs and men at Weston-super-Mare, from old chums, Mr and Mrs Sprackman, Mr and Mrs Sims and Kate, Mr and Mrs Day, Mr and Mrs Whiteford, Mr and Mrs Fabry, Mrs Cook, Mr and Mrs Herbert, Miss Dennis, Mr and Mrs Hazell and Mrs Read, Mrs Hazell, etc. The funeral arrangements were undertaken by E Hart and Sons. He was buried on 26 January 1916 at Shaw Cemetery, Newbury (plot 2840). His grave is maintained by the Commonwealth War Graves Commission. He is remembered on the Newbury Town War Memorial, the parish memorial board and roll of honour (both in St Nicolas' Church, Newbury). As a further blow to Sarah, her third husband, Edward Woods, is said to have run off to Worcester with a neighbour, Minne Thorn, around 1911. A further member of the extended family was to die in the conflict: James' brother-in-law, Albert Corderoy (his wife's brother) died in the Battle of Passchendale in 1917. In 1929 James' daughter married Gilbert Thomas Perring - the son of Thomas Henry Hearder Perring, yet another victim of the war who died in Palestine in 1917. Thanks to Steve Miller, James' great grandson, for his input to this story and the pictures above..